The epitome of a star, this dignified redheaded actress knew how to add spice to a movie when it needed it most. She was perhaps the one of most popular of MGM’s leading ladies in the 1940’s and always presented her characters with elegance and poise. Her success garnered her five consecutive Oscar nominations, a feat only matched by Bette Davis. Eileen Evelyn Garson was born a century ago, September 29, 1904, in a small house in London, England. Her father passed away shortly after her birth, but she and her mother struggled to survive through the poverty that seemed to haunt the Garson household. Garson’s childhood was fairly normal; she had no thoughts of acting but excelled at her studies. She received a scholarship and was schooled at the University of London. Garson did quite well, earning a B.A. with honors in French and 18th century literature. She had strong aspirations of becoming a teacher, but instead took a job with an advertising agency for some time. Acting was not something that held her interests high, but she decided to try to her luck acting in local theatrical productions. Changing her first name to Greer, a derivative of her mother’s maiden name, MacGregor, she made her debut in 1932 in Street Scene and earned the respect of critics. Garson gained herself a good reputation as an exceptionally gifted actress, and rightfully so, under the tutelage of (Sir) Laurence Olivier. The two starred together on the London stage in 1935 and both received great accolades. Garson attracted the interest of Louis B. Mayer while he was making one of his famed trips across the ocean searching for new talent. He convinced her to come to Hollywood on a one-year contract with MGM, earning $500 a week, though Garson didn’t work that first year. Garson returned to London in 1939 where MGM’s Sam Wood was set to film Goodbye Mr. Chips with Robert Donat. She appeared as Mr. Chipping’s (Donat) love interest, adding a touch of romance and strength in Chipping’s lonely, shy life. Her short but endearing performance earned her an Oscar nomination and it seemed MGM had indeed found a new star. MGM was excited about her onscreen possibilities and soon cast her as Elizabeth Bennett opposite Laurence Olivier’s Fitzwilliam Darcy in 1940’s esteemed adaptation of Jane Austen’s Pride and Prejudice. The film wasn’t a huge box-office success, but it did draw favorable reviews from the critics. Maybe it was the famed open-mouthed kiss between Garson and Olivier that stirred the most attention, yet MGM remained confident of Garson’s rising success. She became one of Hollywood’s biggest stars of the 1940s earning five Best Actress nominations in a row for such prestige films as Blossoms in the Dust (1941), Madame Curie (1943) and Mrs. Parkington (1944) (all opposite Walter Pidgeon) as well as The Valley of Decision (1945) with Gregory Peck. Mervyn LeRoy directed the compelling tearjerker Blossoms in the Dust, in which Garson plays Edna Gladney, a Wisconsin woman who moves to Texas and founds an orphanage after she loses her child. It was her first of many films with Canadian leading man Walter Pidgeon. The film, shot in Technicolor, and showcasing Garson’s red hair and strikingly good looks, earned a total of four Oscar nominations. Mrs. Miniver, the Oscar winning Best Picture of 1942, was her second picture opposite Walter Pidgeon and featured a splendid supporting cast that included Teresa Wright, Reginald Owen and Henry Travers. In her most famous role, Garson won her only Oscar for her portrayal of the determined British matriarch in William Wyler’s patriotic World War II drama. Mrs. Miniver was extremely popular on both sides of the Atlantic, becoming one of the biggest successes in the United States during the 1940s. Later that same year, Garson starred in another hugely successful film – Mervyn LeRoy’s Random Harvest, an entertaining romantic story also starring Ronald Coleman as an amnesiac after World War I who is saved from a mental institution by a loving music hall entertainer. 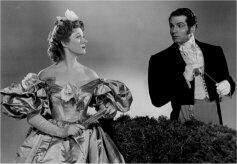 Madame Curie (1943) was a strong and engaging story, with Garson shining in the starring role. Her career was fast on the rise, and she was convincingly leaving her mark on Hollywood. So it’s ironic that Garson’s Best Actress Oscar acceptance speech in 1943 for Mrs. Miniver is now famous as being the longest in Academy history. Reports listed it as being over an hour long, but historians have confirmed that it was only about five and a half minutes long. MGM had been interested in the adaptation of Louis Bromfield’s novel Mrs. Parkington. They wanted Garson for the lead – she accepted – and Mrs. Parkington debuted in 1944, a story about the life of a young mining town girl who marries the mine owner and makes her way through New York high society. MGM was happy with the success of their leading lady and gave her the chance to star in The Valley of Decision (1945). Both critics and audiences alike applauded her performance as Mary Rafferty, a young Irish housemaid who works for a prominent steel mill family who falls for the oldest son, played by Gregory Peck. Garson starred later that year in Adventure, a film that prompted the tagline “Gable’s back and Garson’s got him”. It was Gable’s first post-war film but it was a miserable failure to audiences and critics. Garson had begun a bit of a downward spiral in the following years but her one redeeming performance was in Julie Misbehaves (1948), a lowbrow romantic comedy in which she stars as a showgirl who returns to her long divorced husband (Walter Pidgeon) on the occasion of their daughter’s wedding. In 1950, a project for which Garson had lobbied the MGM writing department, The Miniver Story, was finally realized. A sequel to Garson’s 1942 Oscar- winning blockbuster, the movie follows the Miniver family hardships after World War II. The film was a major disappointment, mostly because audiences wanted to remember Mrs. Miniver as a strong woman who survived the horrors of the war. She requested to play in Julius Caesar (1953), Joseph Mankiewicz’s searing Shakespeare interpretation featuring Marlon Brando, James Mason and Deborah Kerr. The film was a surprising success but it wasn’t enough to keep Garson at MGM. She left in 1954, tired of the numerous disappoints and officially took a vacation from Hollywood. In 1958, she took over the title role from Rosalind Russell in Broadway’s “Auntie Mame” and made a triumphant return to the big screen in her last Oscar nominated performance as Eleanor Roosevelt in 1960’s Sunrise at Campobello. Nearly a decade after she left MGM, she starred in the 1965 Debbie Reynolds musical The Singing Nun before appearing opposite Fred MacMurray in her last film, Disney’s musical comedy The Happiest Millionaire (1967). After a handful of TV movies and appearances, including The Love Boat, Garson retired to New Mexico on the ranch she shared with her husband, millionaire Buddy Fogelson. 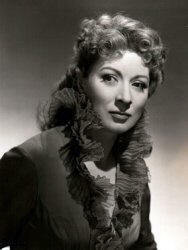 She turned her attentions to causes related to the performing arts, supportive of theatre division of the Meadows School of Arts at Southern Methodist University where in 1990 she gave $10 million toward the construction of the school’s Greer Garson Theatre. The British government named Garson an honorary Commander of the British Empire in 1993. She died of heart failure on April 6, 1996 at the age of 91 and is buried in Texas.